Alexander Sabian works for the Federal Bureau of Preternatural Investigation (FBPI). She’s an Enforcer for the small Mississippi town of Jefferson and the surrounding areas, which means that if a crime is committed by, or against, the rising population of vampires, she oversees the investigation. Being a vampire herself, this has caused some serious tension in the local human population. A rash of vampire murders is shaking the town, and Alex is seeing eerie similarities to her father’s murder. These hair-raising crimes are gruesome, graphic, violent and really do cause you to be afraid. You get glimpses into the mind of the perpetrator that are disturbing and bloodcurdling. I think that for an author to be able to frighten a reader shows a lot of talent and skill, and Jeannie Holmes definitely achieves that. The humans in Jefferson don’t trust the vampires to be straightforward with them. The vampires exposed themselves about forty years ago, and have climbed to the top of the government in that short period of time, leading the humans to be their typical wary, paranoid, bigoted selves. This is a major theme throughout this novel and is done very well. You never know who to trust, which characters will have Alex’s back and which will abandon her. One of the best things about this book was the multiple storylines. At first Blood Law is just a normal murder mystery, then it’s about Alex and her dad, then humans versus vampires and how humans love to hate people, then feds versus local cops, then it’s about Darryl Black and his wife’s murder, then vamps versus vamps. There’s a thousand conspiracies and a thousand ulterior motivations, three for every character. It’s like watching a train crash in slow motion when you have no idea which direction the train is coming from. I really liked the way this book was written, but my connection to the characters was lacking. I think that this might be due to the fact that there are so many different viewpoints (which make the development of the story so awesome). You don’t really have enough time to spend with them to connect. Also, I was really looking forward to the-woman-who-shall-remain-nameless getting what she deserved for being a traitorous, hate-filled bigot, but I really didn’t think she learn her lesson. 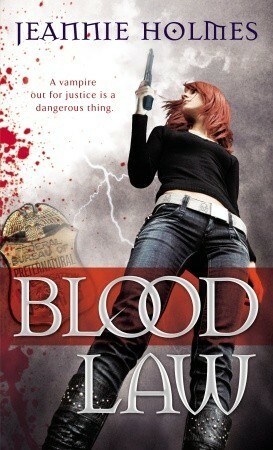 I really liked the writing in Blood Law and think that the series has the potential to be awesome, as long as the future books will allow us to connect to the characters a little better. If you’re a fan of murder mysteries, I think you’ll really like this one.